European companies’ business sentiment in Vietnam is at the highest level in 18 months, EuroCham’s Business Climate Index shows. 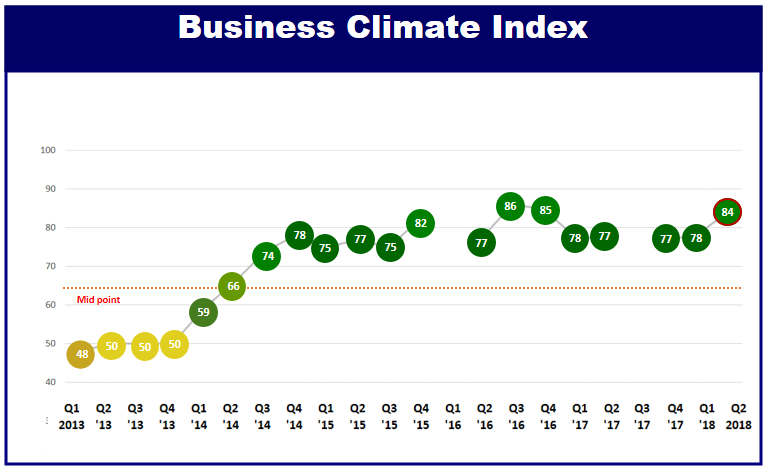 The latest index (BCI), which the business group released Wednesday, is at just two points below the all-time high achieved in the third quarter of 2016. This growing confidence in Vietnam’s trade and investment environment is reflected in a six-point jump in the second quarter of this year against the first quarter. The BCI shows Vietnam is open for business as an attractive trade and investment destination, Nicolas Audier, co-chairman of EuroCham, said in a press release. EuroCham members reported an optimistic outlook on a range of issues, from their own investment and profit projections to workforce levels and Vietnam’s economic outlook. Over 70 percent reported a positive situation at their enterprise in the last quarter, with 62 percent describing it as ‘good’ and 12 percent as ‘excellent’. Looking ahead to the next quarter, 64 percent believed their business situation would be ‘good’ while 15 percent said ‘excellent’. EuroCham members are also optimistic about Vietnam’s economic outlook, with 57 percent predicting ‘stabilization and improvement’ in the next quarter and 34 percent believing it would remain unchanged. Fifty seven percent believed their business would see either a ‘significant’ or ‘moderate’ increase in staff next quarter, while 61 percent expected either a ‘significant’ or ‘moderate’ increase in investment. Over three-quarters of members (76 percent) believed orders or revenues would see a ‘significant’ or ‘moderate’ increase in the third quarter. For the first time, EuroCham asked members for their views on corporate social responsibility (CSR). 87 percent said CSR is important to their business operations in Vietnam. The main motivations for CSR included ‘brand reputation’ and ‘customer/environmental concern’. Vietnam’s GDP grew by 6.98 percent between January and September, the highest nine-month rate since 2011. The economy grew by 6.81 percent last year, the highest in a decade. The foreign sector’s exports in the first eight months of the year were worth $110.3 billion, up 13.4 percent year-on-year and accounting for 71 percent of the country’s total exports of $155.4 billion.